The eternal icefields wear a "necklace of thermal springs", fed from water trapped in fissures and caverns deep in the roots of the Rockies. Raging rivers, glutted by the seasonal runoff, churn and boil like some concoction from a giant soda fountain. Oh the joys of steamy, bubbly-hot, sulfur-scented waters; Solus Par Aqua (health by water) to the Romans; a sacred rite to Canada's native peoples, and Shangri-La to we hot springs fanatics. Speaking of natural spas, the Kootenays have them in spades; Ainsworth, Halycon, Nakusp, Ram Creek and Wild Horse. Many of these natural spas along the Columbia Valley and Continental Divide are so enticing, you'll want to stop the car right there and take the plunge. Poem by Robert W. Service. East Kootenays and Columbia Valley to Golden, Banff and Jasper. : You can relax at one of the local hot spring resort locations, such as Fairmont Hot Springs, which has four pools with an average temperature of 40 degrees Celsius or Radium Hot Springs, with two springs averaging 35 degrees, both north of Cranbrook on Highway 95. Nearby and hottest of all is Lussier Hot Springs near Canal Flats, whose waters hit a healthy 44 degrees. .Map of river and area below shows access via airports and highways..
(See latest Airport Plan) The hub city of British Columbia's East Kootenays is Cranbrook, located in a mountainous region where ranges and valleys run north to south. This geographic event affects the course of rivers and human development. The city has been a major rail center since the opening of the Crow's Nest pass, and is home of the Canadian Museum of Rail Travel. Cranbrook is the largest community in the southeast corner of the province and acts as a major service center for the region. The city is close to several skiing areas. In summer, those opportunities turn to hiking, fishing, climbing and camping as the surrounding mountains provide all the wilderness and scenic beauty imaginable. Its primary industries include forestry and mining. Cranbrook Airport is the gateway to the East Kootenay tourist region and is served by both Canadian Regional Airlines and AirBC, with daily scheduled flights to Kamloops, Vancouver and Calgary. The airport also houses Horizon Air, offering charter services and flight training and Mountain High Helicopters, providing charter services for both business and pleasure travellers. Though less than 30 years old, the airport is nevertheless an essential part of the community, responsible for generating around $40 million for the regional economy annually and sustaining several hundred jobs. One of the regions latest preoccupation is in the area of golf course development. There are now ten 18-hole and a variety of 9-hole courses with an average distance between them of only 35 k, so several can be played in a few days. Destinations to note are Kimberley, Radium and Fairmont Hot Springs, each of which has two courses as well as awe-inspiring scenery. A city of some 18.000 friendly people, Cranbrook is the largest community in the southeast corner of the province and acts as a major service centre for the region. Its own primary industries include forestry and mining while the region boasts a healthy tourism industry. Cranbrook is located in a picturesque, mountainous region where ranges and valleys run north and south, guiding the course of rivers and human development. In summer, golf, hiking, fishing, hunting and climbing are popular pursuits while, in winter, skiing in the surrounding mountains provide panoramic vistas and challenging runs. Those interested in historical sights will enjoy the award-winning Canadian Museum of Rail Travel and the turn of the century Fort Steele Heritage Town, a "living history" town where over 60 homes and buildings have been restored or reconstructed to evoke the turn of the century. Then there's Kimberley, north of Cranbrook on Highway 95A, where you could imagine yourself in Bavaria. Outdoor oompah bands play in "Der Platzl"- the central square- where you can also hear the sounds of the world's largest cuckoo clock. Sam Steele of the Scarlet and Gold was a family icon. 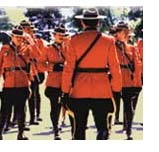 His saga of heroism and grit prompted my father, Don Bird, to leave his Seattle home, enlist in the Royal Canadian Mounted Police and seek a Klondike posting. Shortly after arriving in Dawson City, a local beauty crossed Dad's path, and the rest is history. While Commander Steele roved the entire west during a long and legendary career, his name remains at an historic site, near Cranbrook. An 1860s vintage mining town in the East Kootenays, Fort Steele tops any movie set for authenticity. Behind its walls is a steam railway, a working blacksmith shop, heritage homes, hotels, a newspaper and police barracks. Actors at The Wildhorse Theater and Music Hall relive the glory days when mining was a big time operation. When the CPR went South -- so did the town's fortunes. Four mineral pools tumble down the hillside into the Lussier river at Whiteswan Hot Springs, near a lake of the same name. Many First Nations people made pilgrimages to these sacred waters via the Spirit Trail. At Canal Flats, your map shows two mighty rivers flowing side-by-side. Great lovers in Indian folklore, the Columbia and Kootenay Rivers were pledged to remain apart until completing their separate journeys. Imagine if you can -- two million litres of hot, mineral-rich water gushing from the ground each day. That's a lot of Perrier! With healing powers reputed to relieve arthritis and a list of ailments as long as one's arm, a wily Medicine Man could have made a fortune selling it by the bottle. Known as Kootemik to local Indians, whose legend of Nipika traces their origin, the springs were popularized in the 1890s. At Radium's Aquacourt, you can soak year-round in the steamy, odorless mineral water, or swim in two outdoor pools. The Lodge has an 18-hole golf course, campgrounds and shuttle-bus. According to experts, Kootenay National Park is an ancient ocean floor. Over 70 million years ago, so they say, it was compressed, folded like a gigantic pretzel, and sculpted into what we call the Rocky Mountains. In 1920, Ottawa bigwigs dedicated the park in a move to preserve the canyon's mineral springs, and protect waterfalls along the highway. Landmarks on the Banff-Windermere Parkway include Sinclair and Marble Canyons, Vermilion Pass and the Fireweed Trail. Heard about The Paint Pots? Would you believe they're ponds of red, yellow and orange, just like a kiddies' coloring set? The pots are fed by oxide-bearing streams, and there's an endless supply. For ages untold, Indians mixed ochre from this site with fish oil or animal fat to decorate rocks, teepees -- and each other. Near Vermilion Pass, the Alberta- BC. boundary marks the summit of the Continental Divide; rivers east of here drain to the Arctic Ocean or to far off Hudson's Bay; waters to the west flow to the Pacific. Louise is a hard gal to say good-bye to -- but not to worry -- there's more beauty ahead. The Ice fields Parkway ranks among the world's great highroads, with glaciers standing like 100 icy sentinels. Jasper National Park begins at The Columbia Ice fields, a marvel of nature with the largest mass of ice in the Rockies. A fleet of Snow coaches traverse the Athabaska glacier, looking from a distance like ants on a giant vanilla marshmallow sundae. This seventh wonder is part of a formation that blanketed Canada for a million years. The highway follows the Sunwapta River, joining its cousin the Athabaska at Sunwapta Falls. The hottest water on the entire drive (54°C) is at Miette Hot Springs, near Jasper Lake and Punchbowl Falls. Don't worry, it's cooled to a comfortable 39° in the swimming pool. 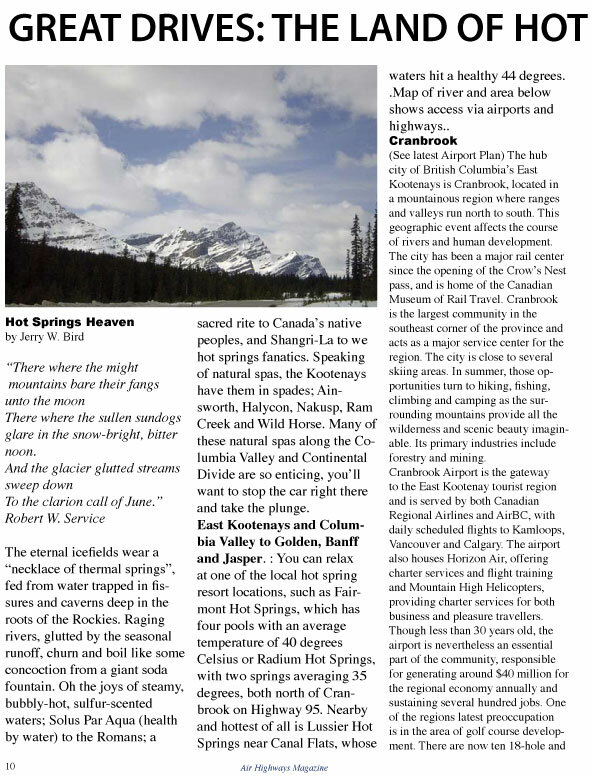 Take the Air Highway to Cranbrook or Calgary Airport, then rent a car for this journey to Hot Springs Heaven. You can do it in high style, at any of the resorts I've mentioned, or rough it with a pup tent, Coleman stove and eiderdown. Glancing at a map, you'll spot many glaciers, mineral spas and place names we haven't had space to mention. 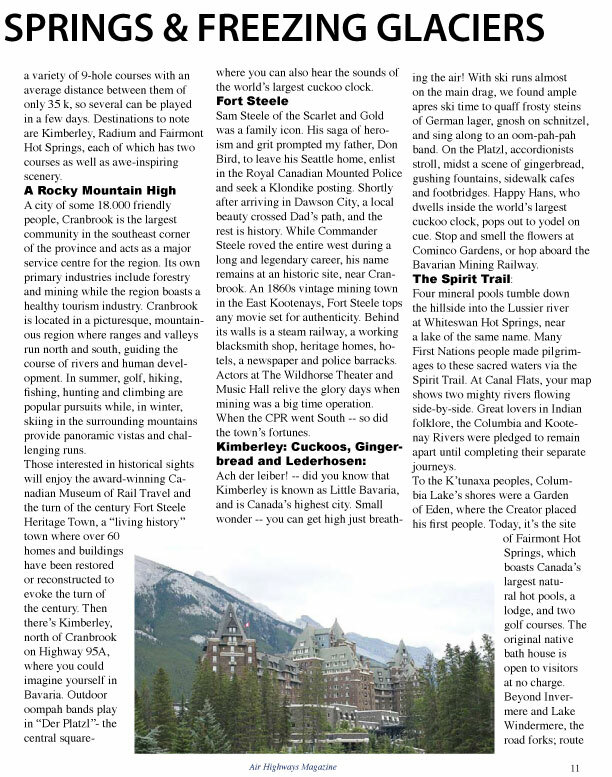 All I can say is -- "don't miss this Great Canadian experience, with its hot springs and freezing glaciers." ...More in our Adventure Roads series.